It's holiday season, and the Olympic games have just started, I know, but I read this great piece in last week's the Economist and I just had to share it with my readers. 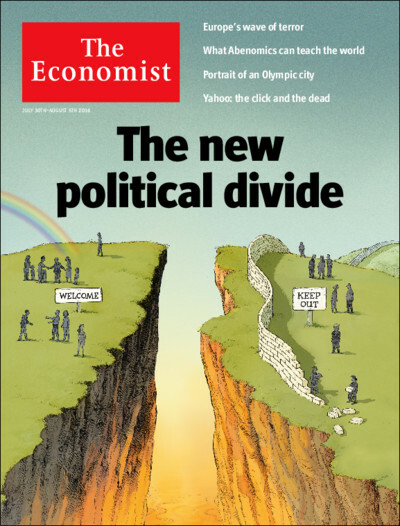 It is possibly one of their best briefing articles to date, as it tackles a very important contemporary phenomenon of a newly arising political divide across the developed world (that was the cover of the entire issue, pictured below). The left vs right is passé, so 20th century. The new distinction is open vs closed. Or in other words, liberal vs national-socialist (OK, maybe not that far away from early 20th century). "IS POLAND’S government right-wing or left-wing? Its leaders revere the Catholic church, vow to protect Poles from terrorism by not accepting any Muslim refugees and fulminate against “gender ideology” (by which they mean the notion that men can become women or marry other men). Yet the ruling Law and Justice party also rails against banks and foreign-owned businesses, and wants to cut the retirement age despite a rapidly ageing population. It offers budget-busting handouts to parents who have more than one child. These will partly be paid for with a tax on big supermarkets, which it insists will somehow not raise the price of groceries." France's Marine Le Pen is hardly any different from this. As is Victor Orban in Hungary. Or Donald Trump, an anti-establishment billionaire (talk about political paradoxes!) with a stringent anti-globalization view, and an elementary misunderstanding of foreign policy, who became a nominee of a party that always supported free trade and a strong US global presence. The list goes on, with the one thing in common is that they all represent a strange mixture of traditionally leftist economic policies wrapped around in right-wing nationalism. One can also argue that Brexit aligned both the far-right voters opposing immigration as well as the far-left voters opposing the "neoliberal" EU (there were other types of Brexit voters as well, but more on that another time). In fact, "neoliberal", whatever it means, became the swear word for both extremes on the left-right axis. Just like in the post-Great Depression era of the 1930s, liberal economic ideas are again facing dangerous populist opposition. "Mr Trump’s charisma aside, the success of drawbridge-up parties in so many countries is driven by several underlying forces. The two main ones are economic dislocation and demographic change. Economics first. Some 65-70% of households in rich countries saw their real incomes from wages and capital decline or stagnate between 2005 and 2014, compared with less than 2% in 1993-2005, says the McKinsey Global Institute, a think-tank. If the effects of lower taxes and government transfers are included, the picture is less grim: only 20-25% of households saw their disposable income fall or stay flat. In America nearly all households saw their disposable income rise, even if their headline wages stagnated. Such figures also fail to take full account of improvements in technology that make life easier and more entertaining. Nonetheless, it is clear that many mid- and less-skilled workers in rich countries feel hard-pressed. Among voters who backed Brexit, the share who think life is worse now than 30 years ago was 16 percentage points greater that the share who think it is better; Remainers disagreed by a margin of 46 points. A whopping 69% of Americans think their country is on the wrong track, according to RealClearPolitics; only 23% think it is on the right one. Many blame globalisation for their economic plight. Some are right. Although trade has made most countries and people better off, its rewards have been unevenly spread. For many blue-collar workers in rich countries, the benefits of cheaper, better goods have been outweighed by job losses in uncompetitive industries. For some formerly thriving industrial towns, the impact has been devastating (see article). Economic insecurity makes other fears loom larger. Where good jobs are plentiful, few people blame immigrants or trade for their absence. Hence the divide between college-educated folk, who feel confident about their ability to cope with change, and the less-schooled, who do not. The second force pulling drawbridges up is demographic change. Rich countries today are the least fertile societies ever to have existed. In 33 of the 35 OECD nations, too few babies are born to maintain a stable population. As the native-born age, and their numbers shrink, immigrants from poorer places move in to pick strawberries, write software and empty bedpans. Large-scale immigration has brought cultural change that some natives welcome—ethnic food, vibrant city centres—but which others find unsettling. They are especially likely to object if the character of their community changes very rapidly. This does not make them racist. As Jonathan Haidt points out in the American Interest, a quarterly review, patriots “think their country and its culture are unique and worth preserving”. Some think their country is superior to all others, but most love it for the same reason that people love their spouse: “because she or he is yours”. He argues that immigration tends not to provoke social discord if it is modest in scale, or if immigrants assimilate quickly. When immigrants seem eager to embrace the language, values and customs of their new land, it affirms nationalists’ sense of pride that their nation is good, valuable and attractive to foreigners. But whenever a country has historically high levels of immigration from countries with very different moralities, and without a strong and successful assimilationist programme, it is virtually certain that there will be an authoritarian counter-reaction." The Economist is right. 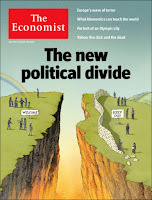 There is a new political divide out there, and it doesn't look pretty. The traditional liberal-conservative debates (big vs small government, cutting taxes vs increasing spending, austerity vs fiscal stimulus) are still out there, but they are being replaced by the more dominant immigration and globalization debates. The far left and the far right are joining forces against the liberals, which are very much in retreat. This is all to familiar in Europe, and should not be taken lightly. The conclusion of the article is positive. It emphasizes that younger generations carry a much more open mindset and are thus much less prone to be on the losing side of globalization, meaning that in 10 years time, as more young voters mature and fully exploit their global opportunities, radicalism will once again be defeated and pushed aside. But in the mean time they will do their damage, that's for sure. Yes its right; The new politics are very differently from old strategy. young (millennials)are not going to right way according to survey. A new era was born as ISIS who attracted the all countries and their peoples.